In February there is the Moussem festival of Sidi Ben Aïssa, one of the events in Morocco which brings together the followers of the Brotherhood of the Aissaoua. During this celebration which lasts several days, the pilgrims settle in Meknes, in tents. Music events and mystic dances are celebrated, along with religious processions and shows with horses. If you are in Morocco in April, keep some time free to attend the Jardin'art festival in Marrakech. Numerous events related to botany, such as ephemeral gardens, workshops and floral displays take over the city. There is also music, craft stalls and all kinds of traditional shows. Also in May, another of the popular festivals of Morocco which you cannot miss is the Kelaa M'Gouna, or Festival of the Rose. The oasis located in the valley of the M'Goun River hosts a festival in honor of the rose of Damascus. 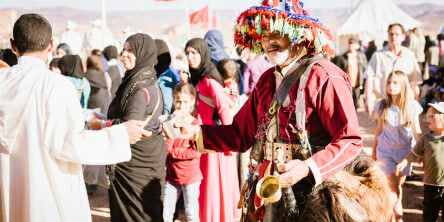 The festival lasts 3 days, where there are concerts of Berber music, traditional dances and songs and the famous rain of rose petals. In July the Moroccans celebrate the National Festival of Popular Arts of Marrakech. This festival has also been declared a Heritage of Humanity for its spectacular display of colour, music and traditional dances. In Assilah, you can participate in the International Cultural Festival which bears the same name. There are concerts, workshops, theatre performances, shows with horses and the most picturesque: the white walls of the city are painted in different colours. In these festivities of Morocco, religious content is celebrated with great fervour and respect, as it commemorates sacred events in honor of important figures of the Sunni Muslim religion. In October and among the popular festivities of Morocco, we can attend the Date Festival. This celebration takes place in Erfoud every 17 October, and coincides with the harvest of this fruit. There are dances and traditional music, and of course stalls with small sweets made from dates. On the other hand, we must remember that, according to the lunar calendar, October is the month of Ramadan. During this month, Moroccans fulfil the tradition of fasting from sunrise to sunset. All the comments below belong to people who have travelled to Morocco with Exoticca in the past 18 months.